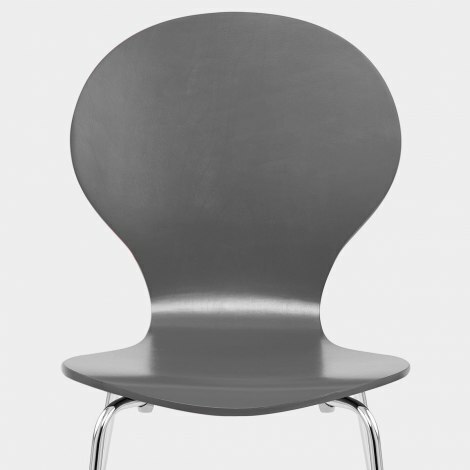 Cool and contemporary, the Candy Chair Grey is truly a modern masterpiece. Effortlessly versatile, the stackable nature of the Candy means it can be compactly stored away when not in use. A marvellous multipurpose model, it is not to be missed. Crafted from a solid wooden frame with a muted grey satin finish, its beautiful bentwood design is ergonomically shaped, sweeping gracefully from the rounded backrest through to the stylish seat. A quartet of polished chrome legs descends to the floor, complete with small rubber plugs beneath to help prevent damage to flooring. "They look fantastic! Really happy with them"
I have ordered from Atlantic before, so I knew I could trust their service and quality of products, These are such a great price and surprisingly quite comfortable to sit on. So easy to put together. They feel sturdy and are stackable. Service excellent and good value for money. Bought 2 of these chairs for our kitchen to go with a small round glass table. They look fantastic! Really happy with them, good quality and good delivery time! Ordered the chairs online late Wednesday night. Was text an hour slot for the delivery which was on Friday afternoon. Brilliant as it meant I didn't have to wait in all day. The chairs look fantastic. They are easy to put together and worth the money spent. They don't take up a lot of room and are in our open plan flat. Very happy with the service and delivery and end product! Will definitely buy again from Atlantic!!! These chairs are really good value and stylish. Very easy to put together and delivery service was excellent I would certainly recommend them a good product.